Alice Jones: The Ghost Light is set in an old, run down theater called the Beryl. The Beryl was once the finest theater in Philadelphia, but after a fire in 1927, it fell into ruin, got a reputation for being cursed and sat derelict for almost a century. It’s an amazingly grand building beneath the years of soot and decay, full of drama and majesty. It’s also completely fake. There are a lot of reasons I chose to create my own theater instead of using a real one, but the biggest was so that I could have total control of all the exits and entrances and any secret spaces that *might* exist. But, the (fake) Beryl Theater was inspired by a very real one in the heart of Center City: The Boyd. The Boyd from the balcony. Photo courtesy of Matt Lambros, After the Final Curtain. My inspiration was twofold. First, The Boyd inspired the look of the Beryl. I love its art deco styling and the immense amount of detail everywhere in the building. I mean, it was a room for watching movies in the dark, but they still intricately carved and painted the ceiling, and custom designed the carpets. Of course, the paint is peeling and there are chips in the moldings-but you can still see how amazing it was once upon a time. Stairs to the balcony, a sign for the lounge and detail etched into the lobby door. Photos courtesy of Friends of the Boyd, Inc. Colored glass detail, fountain-themed plaster molding and the lobby stairway niche. Photos courtesy of Friends of the Boyd, Inc. But beyond just looks, I was inspired by the story of The Boyd and the people struggling to save it from demolition. Starting in 2002, The Friends of the Boyd worked tirelessly to keep the theater going and restore the building to its former glory. I can remember seeing one Friends of the Boyd newsletter at my parents house and being mesmerized by the photos of the theater. The exterior of the Boyd today. The graffiti inspired a brand new character! Sadly, the auditorium wing of the Boyd was demolished in 2015. The facade and Grand Lobby, however, are still standing and The Friends of the Boyd are working to rehome many of the period features saved from inside the building. The Beryl, I’m pleased to say, gets a happier ending. Since Alice Jones:The Impossible Clue came out, it’s been in two lists celebrating Girls in STEM (here and here). I had to look up what this meant. STEM stands for Science, Technology, Engineering and Math, fields that have traditionally/stereotypically been labeled as ‘for boys’. Why didn’t I know this? Well, probably because I went to a school with tons of super smart girls (and boys too) and we all took Calculus and Physics together along with AP English and History. I don’t remember ever being discouraged because I was female, but I had this core of strong, smart supergirl friends all around me. For girls who don’t have that circle of support, I’m glad Alice can be there to show them that loving math can absolutely be a girl thing! I often get asked where my characters come from. To be honest, I’m not always completely sure. In my first book, Casey Quinn leapt (or jetéd) out of nowhere when I was doing a writing prompt. Alice Jones came from my desire to write a detective story, but almost all of my characters have a little bit of me in them-things I like, bad habits, interests, fears, and other odd quirks. Here are a few examples of the things I share with some of the characters from my latest book. Alice Jones: My hardboiled detective gets her love of math from me. I was no genius, but I found geometry and algebra so satisfying. I especially loved factoring equations. Alice’s interests have given me an excuse to brush up on my math skills. Kevin Jordan: Charming enough to get out of most of the trouble he makes for himself, I have very little in common with Kevin (I was the good kid with a guilty conscience, even though I never did anything wrong). But he has a sensible streak I’m happy to take credit for. Sammy Delgado Jr: Sammy gets his relentless optimism from me, but I hope I manage to keep mine from being quite so annoying. Arthur Jones: Alice’s Dad and a reporter for the Philadelphia Daily News. He likes to chug water from a sports bottle while he writes, like he’s running a marathon. My friends used to tease me about this in college, and I still do it today. Delores Jones (AKA Della Lynn): Alice’s twin sister and rising theater star. Alice might not share Della’s love of the stage, but I did! I was an active drama club member in elementary and high school. Alice Jones:Book 2 is set in a theater and I’m having so much fun writing all about life backstage. Dr. Adrian Learner: The scientist who disappears is based on my time interning at The Jackson Laboratory when I was 17. Virginia Lynn: Alice’s mom. We don’t see much of her in The Impossible Clue but we do know she’s a costume designer. She gets that from me. I love sewing big elaborate dresses. I once went dumpster diving at a hardware store so I could get the metal strapping they use to tie planks of wood together so I could make my own hoop skirts and bustles. Recently Girls Heart Books had a great blog post by Sophia Bennett on the best writer’s rooms and sheds. I had a serious case of shed envy. Or tower envy. (Seriously, check out the tower!) I do dream that one day, I’ll have a little room of my own to write in, but for now I do not. Here you can see I’ve got my coffee in easy reach, and tissues (for me or the baby or both? I don’t remember). There’s an old pillow that my son has used as a landing pad one too many times and a toy horse sitting on top of the page proofs Chicken House sent me in the background. BUT the baby is sleeping! Glorious, glorious day. 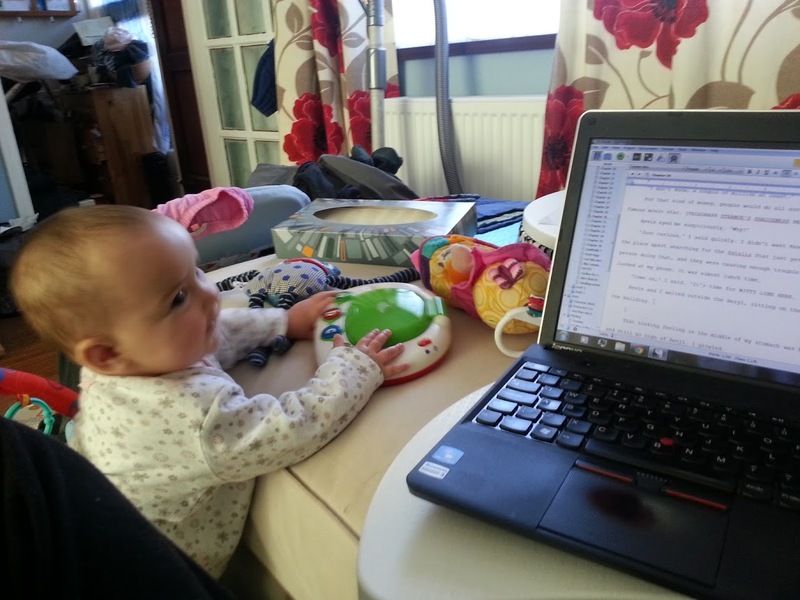 In this photo you can see me trying to give my daughter her own computer to ‘write’ on. She is far too smart for that. You can also see my hoover sitting where I left it to ‘remind’ me I need to use it. I am very good at ignoring it. In the far background, you can see the pile of coats, scarves and notes from school that gather by our front door. And finally, I’ve given in. 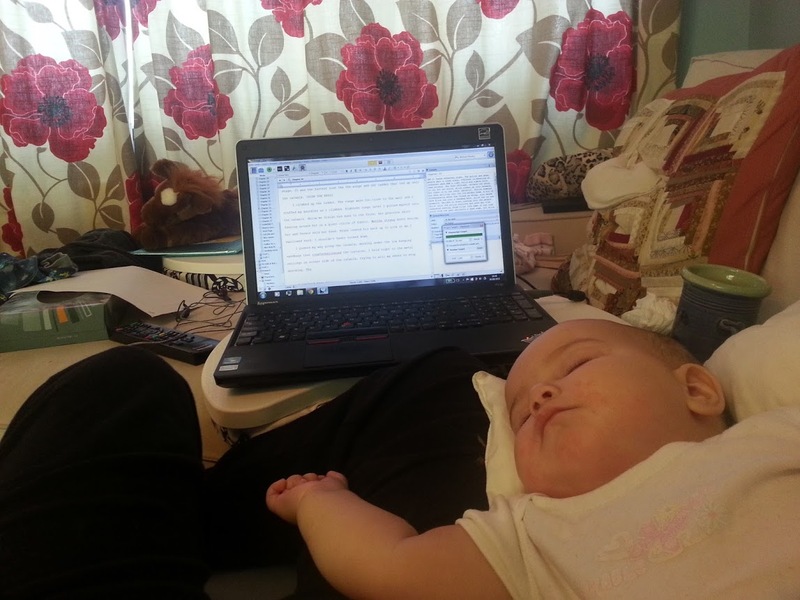 The baby is ‘helping’ me write. 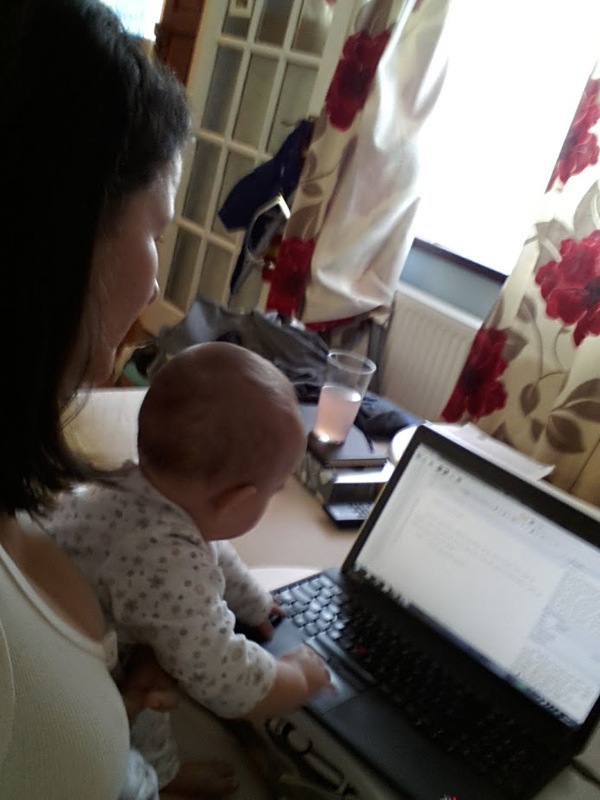 Any typos are hers, all the brilliant bits are mine. I’ll be honest, I don’t get a lot done some days. But I think that’s the life of a writer whether you’ve got a shed or not. I’m always looking for that one gadget that’s going to make writing a breeze (a wireless keyboard, fancy writing software, a dictaphone) but in my heart I know I’m looking for something that doesn’t exist. No matter how many helpful tools you have, you still need to do the hard part. The most important thing isn’t where you write, or what you write with, it’s that you sit down and do it! Don’t get me wrong, there are lots of things I struggle with when I write. I could fill a book. The reason this one issue irks me so much is that I should know better. In fact, I do know better. I know it’s is a contraction of it is and its is a possessive. But when I type at speed, my fingers refuse to leave out the apostrophe. I have resorted to using the Find All feature to check each one before I send out a draft. I wish I’d figured that trick out in college. I had one professor who delighted in red-penning this particular mistake. He didn’t hate me. He thought it was funny. When I was a senior and he asked me to proofread his own book, I was ready for payback. I poured over each page of his manuscript looking for a similar mistake. I bought my own red pen just for the occasion. Did I find one? Nope, not a single incorrect it’s or its in the whole 300 pages. Ten years later and I’m still disappointed. Every author has to deal with rejection. And every author has at least one rejection story they like to share. This is mine. My local library had an old beat-up copy of the Writers’ and Artists’ Yearbook which I studied diligently, taking notes on how to format my manuscript and write a cover letter. I made a list of publishers that accepted picture books, put together my submission packs (refused to let my mother proofread anything) and mailed them off. Finally, months later, I got something back. Not the SASE I had painstakingly provided, but a big padded envelope. It looked like someone had mailed me a dictionary. My mom sat on the couch next to me, bracing herself to soften the blow when the inevitable rejection came. Except it didn’t. Not exactly. Inside the package was a letter stating that the publishing house I submitted to was closing down, and therefore could not accept my submission. But, the letter encouraged me to continue writing and seeking publication. To help me on my journey, someone had photocopied the ENTIRE Children’s Writers’ and Artists’ Yearbook and mailed it to me. Not only that, they’d highlighted the publishers who accepted unagented submissions of picture books. Sadly, I lost that letter years ago, and I can’t remember the name of the publishing house that was so encouraging. BUT, if you were an editor or editorial assistant or some form of sainted intern and you photocopied an entire book to send to a kid (because you must have figured it out, who was I kidding with that handwriting, right?) who wanted to be a writer, Thank You! I didn’t give up. I kept on writing. 20 years later, I’ve had a lot more rejections. But I’ll always remember my first as being the sweetest. Hi. I’m Sarah. I’m a writer! Here, I’ll be talking about the books I’ve written (Dreamer Ballerina) and the books I’m writing. I’ll probably talk a lot about the writing process, and maybe even a little bit about myself.